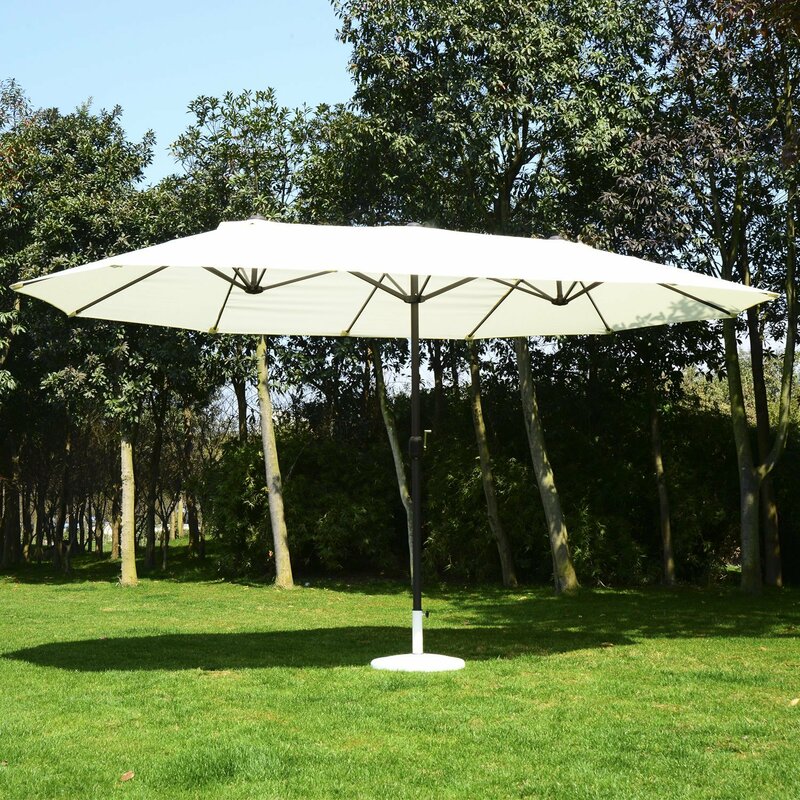 Double canopy structure withstands high winds and allows a pleasurable breeze through the umbrella. 11-foot structure provides shade for a number of individuals in a residential or commercial space. Fade and UV resistant canopy material holds up to excessive exposure to sunlight and protects the user. 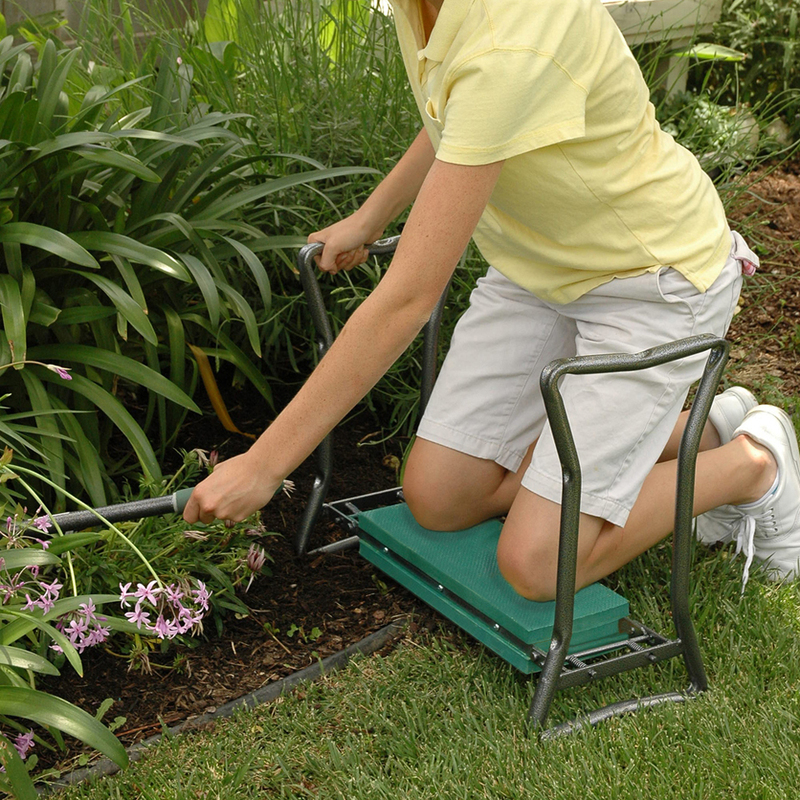 6+ height and angle adjustments to cater to an individuals needs. Easy-to-use crank system for opening, closing, and adjusting throughout its use. Aluminum skeleton protected with anti-oxidation chemicals to resist years of use and exposure to moisture. Expensive product does not come with weighted base. Octagonal shape of canopy may be difficult to fit in certain smaller locations. Top-heavy product struggles to stand alone without weighted base sold separately. 10-by-10 canopy may actually be smaller than advertised online or on packaging. This is the summary of consumer reviews for Purple Leaf 11 Feet Double Top Deluxe Patio Umbrella Offset Hanging Umbrella Outdoor Market Umbrella. The BoolPool rating for this product is Very Good, with 4.10 stars, and the price range is $450.00-$550.00. At such a steep price for an outdoor umbrella, customers demand an above average product that withstands weather, sunshine, and lasts for a number of years. Luckily, reviewers are largely satisfied with the Purple Leaf Offset Hanging Umbrella because of its durability, large size, and versatility when it comes to height, tilt, and more. In fact, many customers say the price is right for a product that is so trustworthy, especially for both private and commercial use. The umbrella may have an odd shape as some customers say, including an octagonal canopy and a unique hanging mechanism, but others believe the different features make it stand out from the rest, giving a residency or property a modern-day twist. This umbrella comes with a durable aluminum frame that withstands oxidation, even after extended exposure to moisture and rain. 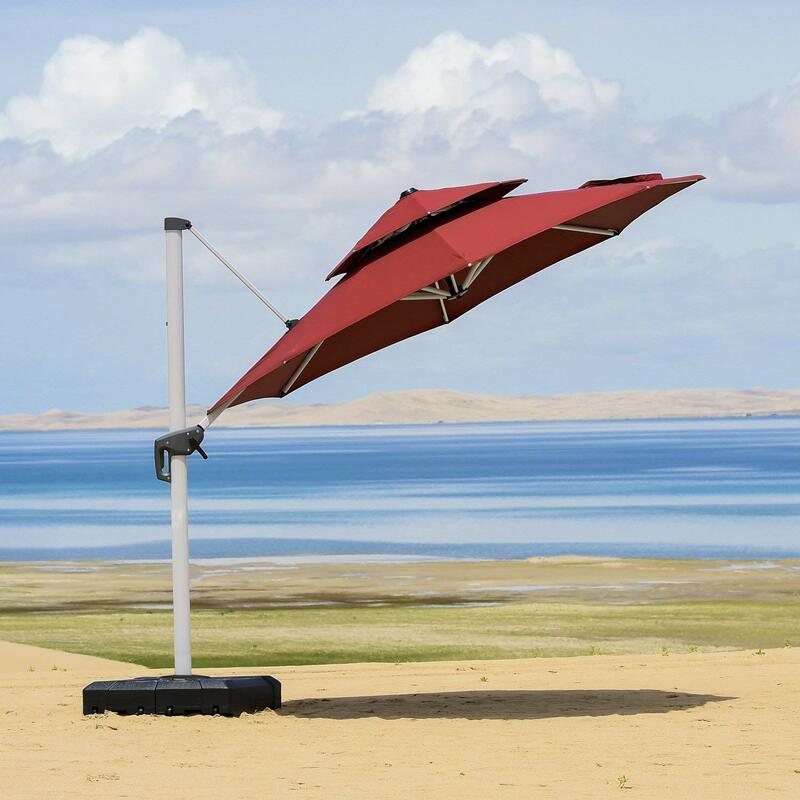 Customers say the product is a lifetime purchase that also does not bend or break during high winds, thanks in part to a double canopy structure allowing wind in and out easily. Overall, many say the product is well made out of strong materials, including the canopy material itself, that withstands fading even after a number of years, and does not rip or tear. One downfall with the product comes with the marketing itself, which advertises a square shape of the canopy, which in person is actually octagonal. Some customers have purchased this umbrella to fit a certain patio space, and have been disappointed that it did not fit because of its eight corners. If you are looking to spend on a product that will last a lifetime and protect yourself and others from harmful UV rays, this umbrella is the one to choose. Aside from the shape, the umbrella is quite sturdy and well made. great product, originally got the octagonal umbrella. once it arrived and was assembled - discovered its octagon shaped. Set it up and this's octagonal, not square as I needed. I liked the thought that it's supposed to be a square 10x10 umbrella like the description says but instead I got a octagon shape!. Package said 10 by 10 and website said square but like many other people we got an octagonal umbrella and of course returning it's going to be a hassle. (aside from the shape, the umbrella is quite sturdy and well made). After trying 8 other umbrellas and numerous stands, we're totally satisfied with this purchase. Superior quality at a reasonable price. Big enough to cover our whole seating area. After trying 8 other umbrellas and numerous stands we're totally satisfied with this purchase. I'm not happy for the fact it won't stand at all without a weighted bace. Purchased this prior to looking at adding a lattice cover to our patio. It won't stand freely with minor winds. Only omportant thing is you also need to purchase weights for the base with it. This's an ideal size and extraordinary quality for our pool. I'm more than satisfied with this umbrella. At the 446.00 price it should come with a bace, the bace built for it's 150.00 that puts the whole purchase at aprox 600.00. It's a sturdy looking umbrella. Look how my package arrived lol. My dog ate the turn handle. Looks terrible, still works though. No contact for replacement parts. Looks like a mighty hassle to repackage and return, will learn from lesson and buy large articles locally in the future. Mine showed up a little different than some of the other reviews it'd two crank handles not just one. Easy to rotate and to open and close. 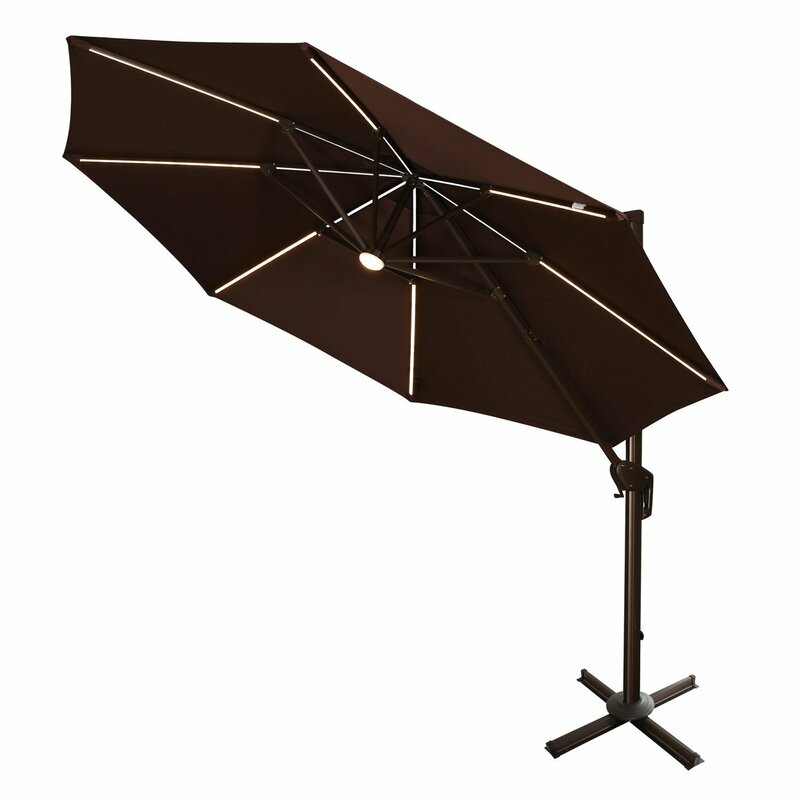 Love this 10 foot umbrella , in terra color, easy to assemble and very sturdy, easy to follow instructions. 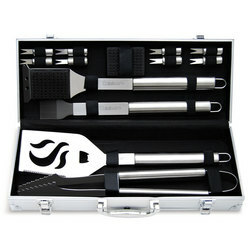 Opens easy and heavy duty. Looks great and is really easy to use. great quality, easy to set up and use. Seems to be very well-made easy to assemble and looks great. Cover (included with the umbrella) is also really nice and easy to use. This Purple Leaf 8 foot square umbrella is well made and easy to put up and take down. Stands up well against the wind. Lovely & well worth the $$ !!!. You need the heavy duty base. Got heavy duty base with it. Appears to be a very well made umbrella, anodized aluminum mast with heavy duty cast aluminum handle. This's a very large well engineered, well built offset square umbrella. Even with heavy winds it holds up great!. Well constructed with noticeable attention to finishing details. It would also be great if they' had a base that looks like the water ballast base but allows the use of sand, steel plates, or a water option. 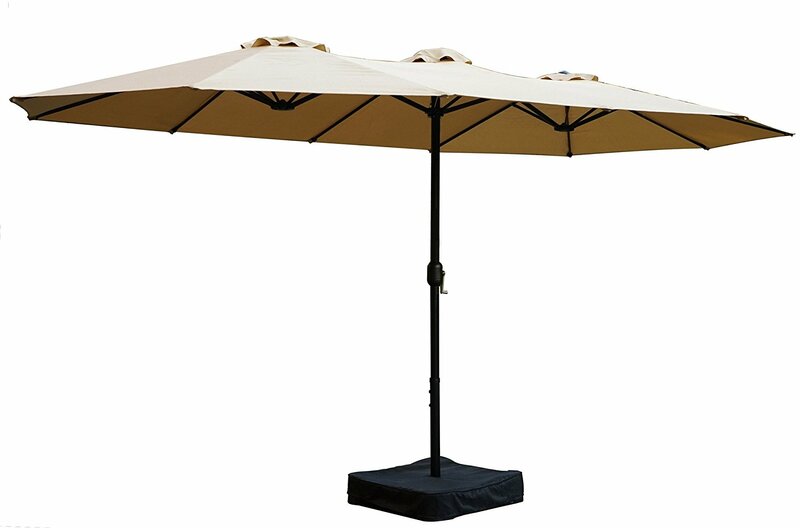 We purchased the Purple Leaf Offset Patio Umbrella Base Sand/Water Filled Set Pack of 4 Square too, which provides a very sturdy base. With the base it seems very sturdy. As others have suggested, make sure you buy the matching water-filled base (even though the base expensive!). Great product...well constructed, Get the Purple Leaf base. 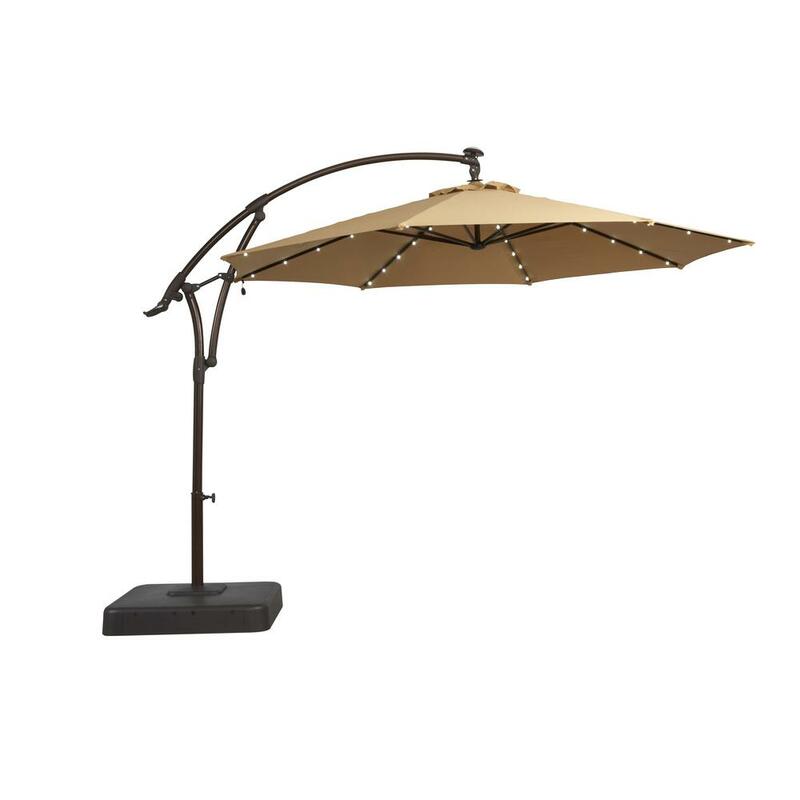 Absolutely fantastic umbrella for the price adjustable and rotating base, large area shaded, and adjustable tilt for maximum shade. I bought the purple leaf base you definitely need a base whether you're in a windy place or not. I secured base with water ballast and added another 200 lbs in steel plates on top of the base to protect against gusting winds (did this with the old umbrella in addition to the sand in the base). 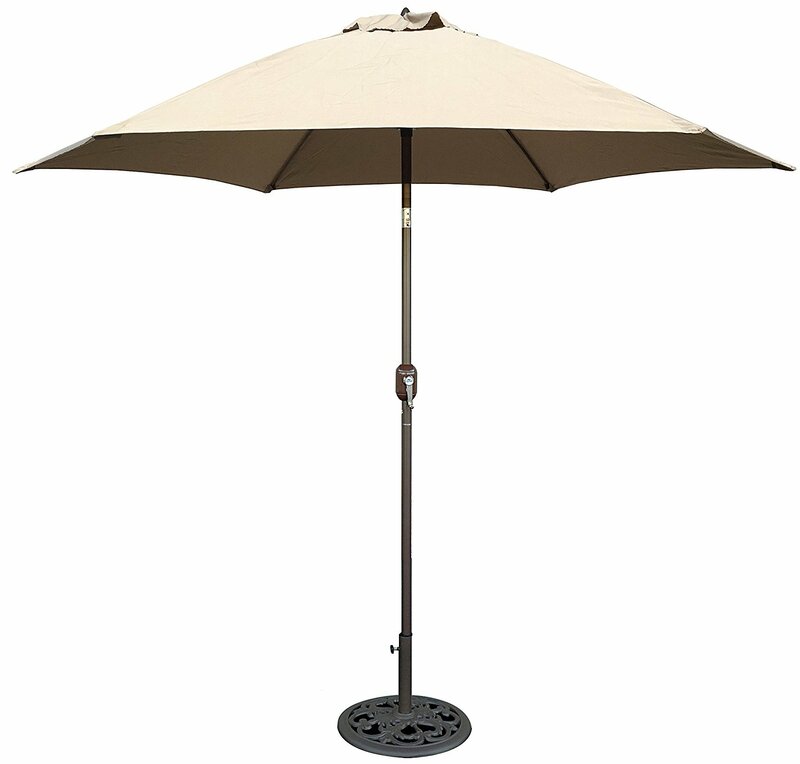 We bought the Purple Leaf Offset Patio Umbrella Base which is sold separately, after reading reviews. It'd also be great if they'd a base that'd look like the water ballast base, but allow the use of sand, or steel plates, or a water option.